What % breast cancer research grant dollars go to grants that include metastatic? One of questions that arose from the visualizations I published here a couple of days ago, was what proportion of grants go to metastatic breast cancer? So I went back to SciVal Funding, and repeated the search I had done, but this time either included or excluded the word “metastatic”. This time I included international grants and smaller grants too. I did not repeat the work of cleaning up the recipient institutions names or add geolocation, beyond country, so the visualization is pretty high level. It is also possible that some grants were missed – they may not have had the word metastatic in the materials captured in the database (title of grant and part of the abstract). Lastly, all currencies are reported as US $ without converting them, so totals need to be taken with a grain of salt when looking at foreign grants. 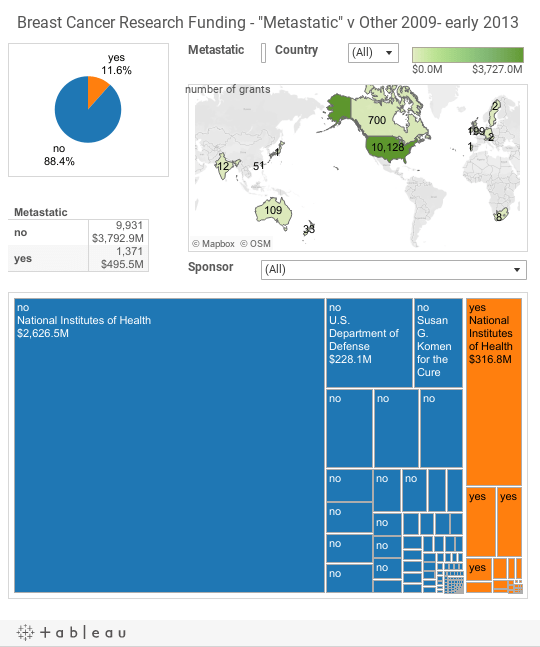 Nevertheless, using this visualization you can get an impression of the proportion of grants that involve metastatic breast cancer both by country and by funding source. This entry was posted in dialog on breast cancer and tagged funding, research, visualization. Bookmark the permalink. Where is the 1% research funding for the 1% of breast cancer patients: men? Cool, Oliver! What kinds of preliminary interpretations do you have of these data? If I am reading the figures correctly, it looks like less than 8% of research funding includes metastatic disease. If the stats I’ve been reading recently that 20 % of breast cancer patients go on to develop metastatic disease, then one interpretation would be that this supports the assertion that metastatic breast cancer is underfunded. I know that representation based on percentage is only one criterion that goes into funding priorities but it is a pretty straight forward one. I think that is a good way of looking at it. Of course, you could also argue that since metastatic cancer presents the greatest risk to life, it should be emphasized more. At present though research in this area is limited in part because there are fewer good models, fewer good samples and less funding. One key challenge is that the best cancers to study are ones where there is material to study. Metastatic disease is often treated systemically with chemo, or locally with radiation. Rarely are they resected, and only a few biopsied. But I would agree with you – it is underfunded. I agree. The seriousness of the condition is another criterion for funding priorities, which would also argue for increased resources. So metastatic tumors are rarely resected or biopsied? I didn’t know that. Is that just true for humans or in animal research, too? Actually, an 30% of breast cancer patients go on to metastasize which is believed to be in addition to the 5% that initially present at stage IV. The research estimate may be high for the reason that this was likely a word search. A fair amount of research states the goal of “prevention of metastatic disease” which is treatment of primary BC. It is not the same as research to find solutions for those who already have metastatic disease. Lengthy research done by reviewing entire grant registries have been few and far between but came up with 0.5% for the NCI and 2.3% for the American Cancer Society … both of these now a few years old. Overall today it is likely closer to 2% on average and this is for stage IV cancer all types, not just breast cancer. Thanks for the comment. Interesting. You are right, this was a word search- I don’t have the resources to do the kind of study you describe- and as such is likely an overestimate. I reasoned that studies aimed at metastatic disease would include this word, and that others were less likely to, especially in title and abstract. Oops, ignore the second part of my comment. I didn’t read your explanation thoroughly enough. So it sounds like you are saying that once cancer is metastatic rather than it is hard to do resection or biopsy and this difficulty places restrictions on what can be studied in respect to this stage of the disease.